Illusions and Paradoxes: Seeing is Believing? This page illustrates that our visual perception cannot always be trusted. The components of an object can distort the perception of the complete object. Our mind is the final arbiter of truth. Most optical illusions are the result of 1) incongruent design elements at opposite ends of parallel lines, 2) influence of background patterns on the overall design, 3) adjustment of our perception at the boundaries of areas of high contrast, 4) afterimages resulting from eye movements or from kinetic displays, or 5) inability to interpret the spatial structure of an object from the context provided by the picture. Optical illusions have been studied for millenia. 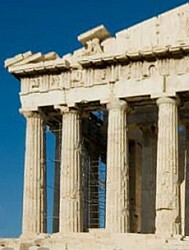 The ancient Greeks used a technique known as entasis which incorporates a slight convexity in the columns of the Parthenon to compensate for the illusion of concavity created by parallel lines. 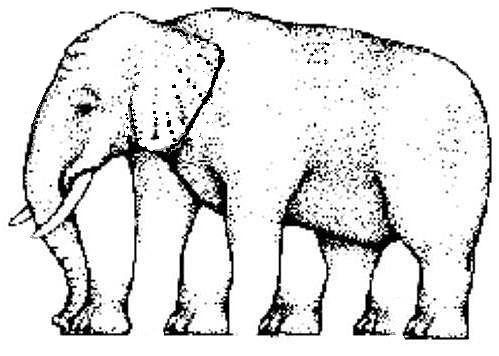 Many of the following illusions have been popularized by psychologists and artists like Hering, Ehrenstein, Meyer, Zöllner, Müller-Lyer, Poggendorf, and Escher. How can the man go up all the time? Can such a staircase be built as a real object? and in the lower part of the "X"
Stairway between corners of a flat square. You can go from corner A to corner B by climbing the stairs or by going around a level plane. The rows of black and white squares are all parallel. The vertical zigzag patterns disrupt our horizontal perception. Color the elephant with crayons or colored pencils making sure to stay within the lines. Click the image to display it in a new page for printing. Impossible triangle. This triangle cannot be built as a real object. Can you find a relationship between this triangle and a Möbius strip? The radiating lines influence our perception of the parallel lines. The circle and the squares appear distorted by the background patterns. The Vertical lines are both the same length. The diagonal lines A-B and B-C are equal in length. The pillars are identical in size. Our intuition about perspective influences what we see. Three-prong fork and two sticks? Incongruous design elements on opposite ends of the parallel lines create confusion. Without depth clues, this line drawing has two different three-dimensional interpretations. The shade of the center dot is the same in all the squares. but each square seems lighter on its left edge than on its right edge. All the bumps are identical. The image in the lower right corner is upside-down, and the image to the right is rotating. Our interpretation of bumps and indentations is conditioned by the fact that objects are generally illuminated from the top. The rotating image may be interpreted as a wobbly elongated object viewed from the end (like a finger pointed in your direction) or as a ball rotating inside a washing machine viewed through the porthole. The ambiguity is caused because we don't have any clues to decide whether the bright portion of the image is above or below the display plane. as our eyes shift to examine the picture. This image has only three colors. What appears to be blue and green is actually the same color. The altered perception is caused because the eyes combine adjacent colors. The circles appear to rotate when you move your head closer and further away from the screen while looking at the dot in the center. Our peripheral vision interprets the relative increase or decrease of the image in the retina as rotational motion of the slanted lines. There are no curved lines in these figures. You can use a ruler to check it out. The diagonal patterns created by the tiny squares distort the perception of the pictures. The retina is the part of the eye covered with receptors that respond to light. A small portion of the retina where the optic nerve connects to the brain has no receptors. An image that falls on this region will not be seen. Close your right eye. With your left eye, look at the L below. Slowly move your head closer or further away from the screen while looking at the L. The R will disappear when your head is approximately 50 cm (20 in) from the screen. You can repeat the experiment with your right eye by looking at the R.
An afterimage is a visual impression that remains in the retina after the initial stimulus is removed. The afterimage always has colors that are complementary to those of the original image. Look steadily at the cross in the center of the picture to see an afterimage. Jeremy L. Hinton ca. 2005, "Lilac Chaser"
Take two pieces of heavy paper. On one of them make three holes with a pin spaced about 2 mm apart (1/16 inch) from each other forming a triangle. On the other one piece of paper, make a single hole with the pin. Place the card with the three holes next to your eye and look through the holes at the card with one hole. You will see three holes instead of one, and the pattern of holes will be upside down. 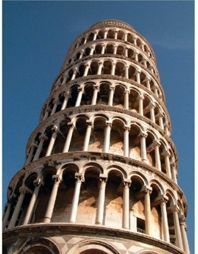 Which of the following two images of the tower of Pisa seems to be leaning more? The images are actually identical, but the tower on the right seems to lean more because the human visual system treats the two images as one scene. Our brains are conditioned to expect parallel towers to converge toward a common vanishing point, but because the tower on the right does not converge, our visual system interprets that it is leaning at a different angle. Below is a perspective drawing with three vanishing points of what our eyes expect. Hold your head steady and fix your eyes on the dot in the center of the picture. The colored dots will seem to disappear in a few seconds. The effect is due to retinal fatigue which occurs when the afterimage of an object cancels the stimulus of the object on the retina. The effect is most pronounced when the objects do not have well-defined edges that are detectable by small eye movements. This is another example of incongruous design elements on opposite ends of parallel lines. Design patterns make the circles appear to be distorted. The circles above appear distorted due to the black and white designs which are at various angles relative to the tangent of the circles. The image below consists of circles formed from alternating black and white squares angled at 15 degrees relative to the tangent of the circles. The circles appear to form helical patterns because the squares in each of the adjacent concentric circles incline in opposite directions. Prof. Dr. Michael Bach of the University of Freiburg, Germany has produced this interesting kinetic image. 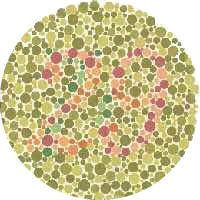 Fix your eyes on the center dot. Note that one or more of the yellow spots disappear once in a while, although the 3 yellow spots are continuously present. The projection of the dots in the same location of the retina cause local adaptation that makes the image disappear. The controls of the animation allow you to adjust the speed, dot size, and background color. The squares labeled A and B are the same shade of gray. This can be verified by joining the squares marked A and B with two vertical stripes of the same shade of gray. The illusion that B is lighter than A is caused by the relative contrast of the surrounding dark squares and by the fact that our vision compensates for the shadow of the cylinder. Created by Edward H. Adelson, Professor of Vision Science at MIT. Although there are only circles with sections taken out of them, our eyes strive to see triangles. The sides of the triangles may appear curved when the angles of the sections do not add up to 180 degrees. A portion of misplaced lines can be clearly identified as forming a circle, even when there is no outline of a circle. Our ability to reconstruct an image enables us to recognize a face even when half of the image has been blocked, including parts of the eyes, nose and mouth. Animals which blend with the color and texture of their environment are more likely to survive either as prey or as predators. Camouflaged prey have a greater chance of surviving by avoiding detection, whereas camouflaged predators can hunt more successfully if they can approach the prey without being seen. The coloration of zebras makes them very conspicuous in the African plains, but the pattern of black and white stripes makes it very hard for predators to distinguish one individual in the middle of the herd. Do you see eight or nine zebras? 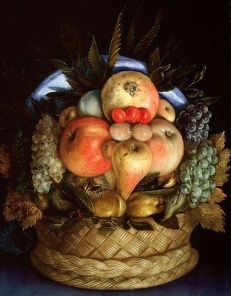 In the 16th century, Giuseppe Arcimboldo became known for his portraits of human heads made entirely of fruits, vegetables and flowers. Some of his paintings of bowls of vegetables had to be inverted in order to see the bowl become a hat for the human head. This whimsical art form is still popular today. The following drawing of a frog turns into the head of a horse when the image is rotated. Place the cursor on the images to see the alternate interpretations. The figure in the top can be interpreted as a cube or as a corner. The darker shading of the bottom section reinforces the interpretation of a cube illuminated from the top. The figures below it add some elements that help us to disambiguate. as our eyes shift across the page. Silhouettes may have ambiguous interpretations. In this example, the silhouette of the lady may be interpreted as a front view or as a back view. On what leg is the dancer standing? The direction of rotation of silhouettes may be ambiguous. This dancer created by Nobuyuki Kayahara stands on her left leg when she appears to be rotating clockwise, but on her right leg when she appears to rotate counter-clockwise. 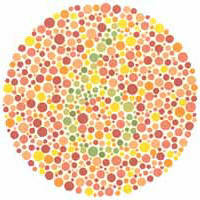 People with normal color vision can perceive numbers formed by patterns of colored dots in every circle. If you do not see some of the numbers, you should have your eyes checked and consider working in a job where color discrimination is not critical. 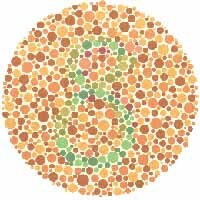 Approximately 6%-8% of people of European descent, 4%-6% of people of Asian descent, and 2%-4% of people of African descent have some type of defective color vision. 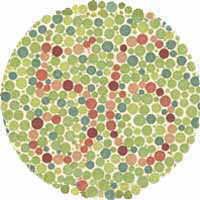 Images based on Tests for Colour Blindness by Dr. Shinobu Ishihara. As an experiment, look at these circles with blue-red 3D glasses, first with one eye, and then with the other. Some of the numbers will not be visible! 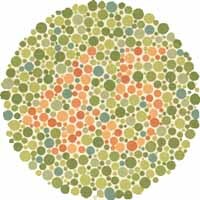 Also, use the glasses to look at the word color test below and explain the results. Dr. Marc Amsler developed the use of a grid of horizontal and vertical lines to monitor a person's central visual field. The test is performed by first covering one eye and looking at the center dot. The test is repeated by covering the other eye. Any distortions, wavy lines, blurred areas or blank spots may be an indication of macular degenertion. On December 16, 1997 hundreds of Japanese children suffered seizures and convulsions following their viewing of a "Pocket Monsters" cartoon on television. Most children said they felt sick and had vision problems during a scene where the entire background was flashing red and blue. Additional children ended up in the hospital after the cartoon segment was replayed in the evening news. Neurologists believe that the children suffered photosensitive epilepsy induced by the flashing. Abnormal EEG can be triggered by flickering lights in a small percentage of persons when the flickering frequency is 5-10 hertz for children and 15-20 hertz for older people. Excessive TV watching can damage a child's development and education. Warning: Do not place your mouse cursor here if you are subject to seizures. 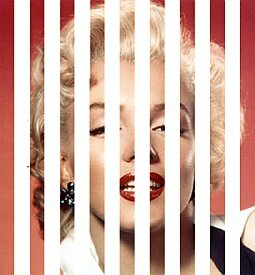 Moiré patterns are formed when two grids or line drawings are superimposed. The intersections of the lines create new patterns not present in the originals. This figure is created by overlapping two drawings consisting of lines radiating from a point. The interference pattern creates circles that cross both points. The colored pieces of this puzzle can be rearranged to form two "13 by 5 right triangles" that have different surface areas. This is a visual paradox that can be explained mathematically. Click here to go to the Puzzles page which has the explanation. Humpty Dumpty is about to take a great fall because he just found out that the two red lines are equal in length. Take a ruler and connect the tops or bottoms of the red lines. The brain interprets the converging lines as providing perspective. This interpretation is so powerful that it is virtually impossible to overcome its influence. Fraunhofer diffraction is a type of optical wave diffraction that occurs when field waves are passed through an aperture or slit, causing the size of an observed aperture image to change due to the far-field location of observation. This image shows how the slits of vertical blinds in a window bend the rays of the sun and influence the shapes of the shadows projected on the wall. 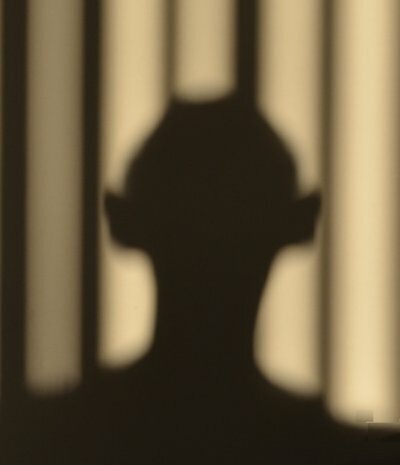 As the ears approach the shadows of the vertical blinds, the shadow of the ears stretches toward the shadow of the vertical blind to produce elongated ear shadows. The shadow of the head seems to grow horns at the points where the shadows of the blinds intersect the head. These people are shifting places trying to hide. Sometimes you can count 13 people and sometimes 12. Who is missing when the count is 12? Special effects produced by computer animation enhance many modern films. 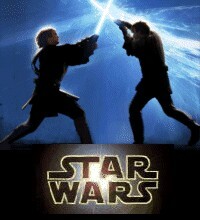 Click the link below to see some short clips of Star Wars light sabers in action. A subliminal effect is a sensory stimulus that is beneath the threshold of consciousness which causes us to respond instinctively in some way. Subliminal effects are exploited in horror films that use creepy music which builds up gradually to maximize the effect of an unexpected visual surprise, e.g., Jaws (1975), Psycho (1960). Marketing campaigns sometimes use subliminal visual effects that tantalize or excite us to counteract negative attitudes about a product or to increase the appeal of a product. The following figure is a portion of a picture that was widely published in advertisements during the mid 1990's. Do you know what it is?